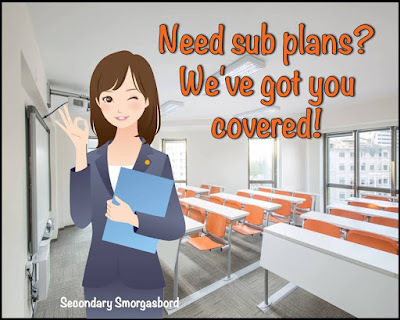 One thing I've learned (the hard way) is that 3 critical elements must be included in emergency plans if my classes are going to run smoothly when I’m absent. The instructions must be simple (so they’re understood by students and substitutes). The tasks must be relevant (so students know that their work will be revisited or assessed). The lessons must be fun (so that even the most resistant learner will want to do the assignments). Simply put: Poorly planned lessons + a day with a substitute = Epic Fail. 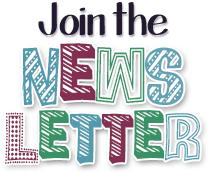 So what kinds of assignments set students and guest teachers up for success? 12 Hink Pink cards are included in the Emergency ELA Sub Plans freebie. 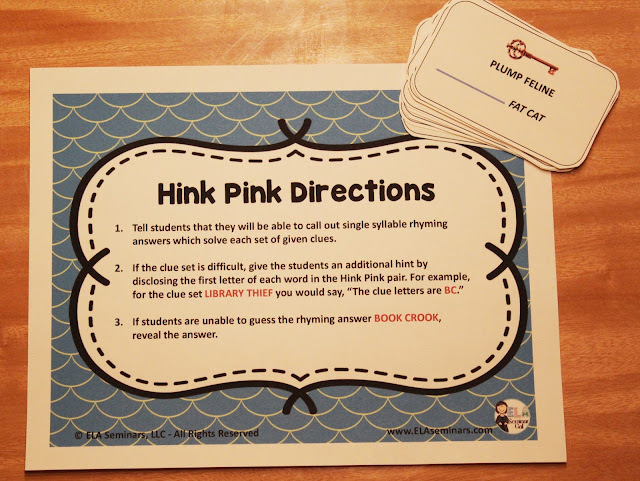 Hink Pinks are designed to be used as teacher-led sessions in which students call out single-syllable rhyming answers. 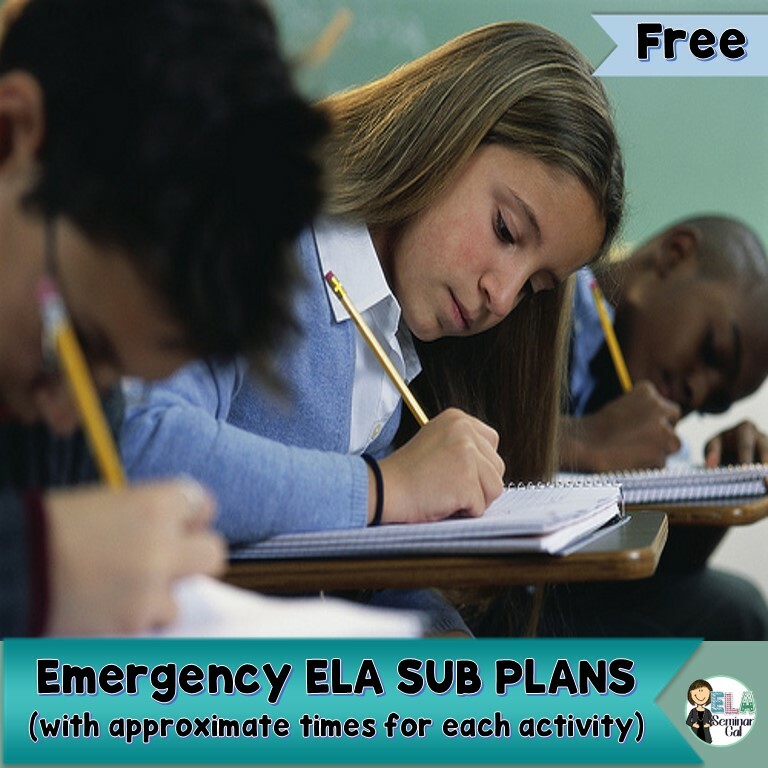 Pick up these interactive point of view sheets in the Emergency ELA Sub Plans freebie. The title of this lesson is Make Your Characters Jump Off the Page. Students will receive one Slide and Stop direction card and one 60-80 Word Dash task sheet. The substitute will instruct students to drop their fingers into column #1 and slide their fingers up and down the column (without looking) until they hear the word STOP. This will tell the students what their personality types are. Then onto column #2 to find out who they will become for the writing assignment. And finally, the last slide-and-stop (column #3) will identify their setting. 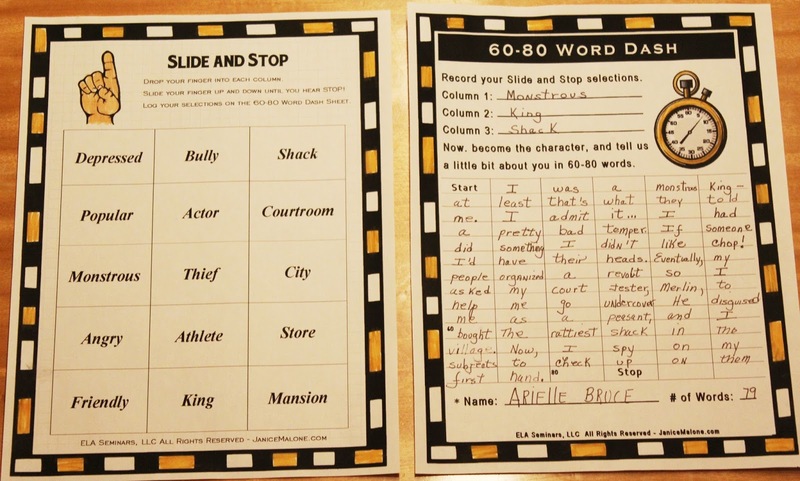 Students will then write their Slide and Stop combinations on the 60-80 Word Dash task sheets. If time allows, students get into pairs and ask each other questions. Note: The most important part of this task is that students must answer questions as if they are the characters they selected. 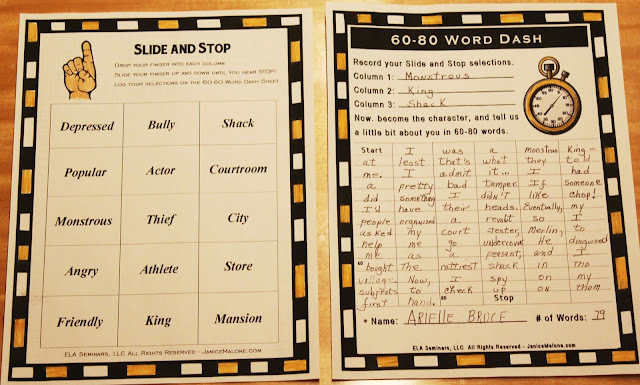 Then students will give us a little peek into their new lives by writing a 60-80 word snapshot. This activity is always a hit with substitutes and students. Simulated Research Notes and a Ben Franklin biography frame are included in the Emergency ELA Sub Plans freebie. 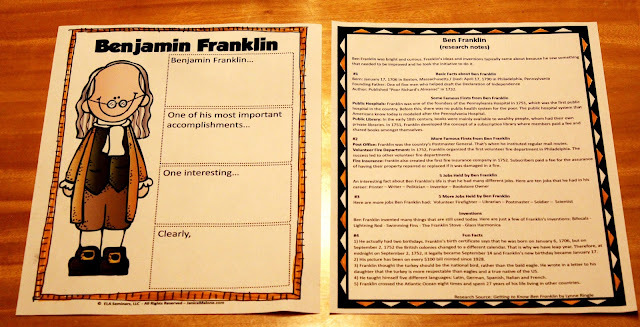 Biography Research Frames help students realize how fascinating research can be by giving them nonthreatening paragraph frames that make research projects easy to do and enjoyable to present. In this final assignment, student pairs will jigsaw information about Benjamin Franklin and come to consensus about what information should be included in the paragraph frame. Students will present their paragraphs when I return. Love the Hink Pinks! This would be so much fun, but also engaging and critical thinking, for any age group. Your Research task looks great! The process is nicely broken down and would be perfect on a sub day! Your go-to formula is spot on, thanks for sharing your ideas! Love the hink pink idea!! 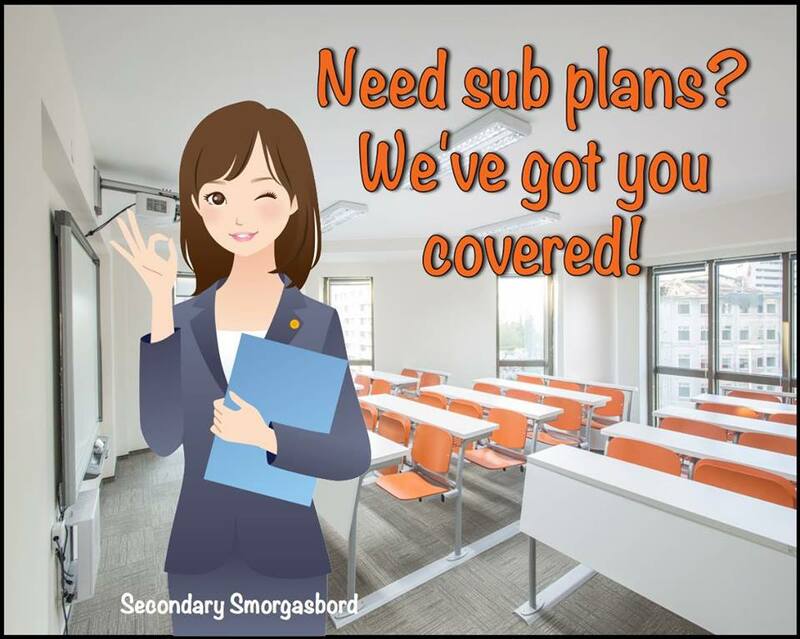 Simple-Relevant- Fun-are top adjectives to summarize sub plans. You are so right, poor planning + substitute = epic fail. I love your Hink Pinks to help avoid that conclusion. Love the slide-and-stop technique! This could be used with so many lessons whether it's for for a substitute or not.